Drs. Fumio Inagaki and Yuki Morono, Geomicrobiology Group, Kochi Institute for Core Sample Research at Japan Agency for Marine-Earth Science and Technology (JAMSTEC: President Asahiko Taira) participated in the Integrated Ocean Drilling Program (IODP)*1 Expedition 329 “South Pacific Gyre Subseafloor Life” jointly with University of Rhode Island, USA, The University of Tokyo, Hiroshima University, University of Shizuoka, University of Tsukuba, and other international institutions (Co-chief scientists: Prof. Steven D’Hondt at University of Rhode Island, USA and Dr. Fumio Inagaki at JAMSTEC). During Expedition 329, using the drilling vessel JOIDES Resolution*2 , the sediment core samples*3 from the seafloor to the basement were collected from seven sites in the South Pacific Gyre. The area is mostly characterized by the open ocean4, which is known to be the clearest sea in the world because of the least photosynthetic production in the surface seawater. On the ship and at shore-based laboratories, the sediment core samples were analyzed by microbiological and biogeochemical techniques, and then compared and integrated with other marine sediment data on sedimentation rates and oxygen level. As a result, it demonstrated that dissolved oxygen is present throughout the entire sediment column from the surface to the oceanic crust (i.e., basaltic basement), even at a site where crustal age is more than 100 million years old. Based on these and other oxygen and sedimentological data, the similar condition of sediment is occurred in up to 37% of the world’s ocean and 44% of the Pacific. Moreover, the state-of-the-art microbiological technique presented evidence that microbial cells are observed in sediment from the seafloor to the basement, in numbers of several orders of magnitude lower than those previously observed in anaerobic, organic-rich sediment on the Pacific margins. This indicates the existence of aerobic and ultra-oligotrophic microbial communities in the global open ocean subsurface, where there is no depth limit of life in the sedimentary environment. These findings are very significant as it shows that Earth’s element cycles and the deep subseafloor biosphere are much broader than previously thought. This study was supported in part by the Japan Society for the Promotion of Science (JSPS) Grants-in-Aid for Science Research (no. 26251041, 24651018, 24687004) and GR102 in the NEXT Program (Funding Program for Next Generation World-Leading Researchers). These study results have been posted on the online journal, Nature Geoscience on March 17, 2015 (JST). Affiliation: 1. Integrated Ocean Drilling Program Expedition 329 Shipboard Scientific Party 2. University of Rhode Island, USA. 3. Kochi Institute for Core Sample Research, JAMSTEC, Japan 4. International Ocean Discovery Program, Texas A&M University, USA. 5. University of North Carolina at Wilmington, USA. 6. Swiss Federal Institute of Aquatic Science and Technology, Switzerland 7. Universität Oldenburg, Germany 8. Max-Planck-Institute of Marine Microbiology, Germany 9. Aarhus Universitet, Denmark 10. Oregon State University, USA 11. Minnesota State University, USA 12. Hanyang University, Korea 13. GFZ German Research Centre for Geosciences, Germany 14. Yonsei University, Korea 15. University of Melbourne, Australia 16. Texas A&M University, USA. 17. University of Shizuoka, Japan 18. Boston University, USA. 19. University of Tsukuba, Japan 20. Hiroshima University, Japan 21. University of Southampton, United Kingdom 22. University of Bergen, Norway 23. The University of Tokyo, Japan 24. Dublin City University, Ireland 25. Institut Français de Recherche pour l'Exploitation de la Mer, France 26. Chinese Academy of Sciences, People's Republic of China 27. Ocean University of China, People's Republic of China 28. University of Southern California, USA. *1 The Integrated Ocean Drilling Program (IODP) is a multinational cooperative project carried out from 2003 to 2013 at the initiatives of Japan and the U.S. The scientific drilling vessels D/V Chikyu operated by Japan and the JOIDES Resolution by the U.S, and the option to charter mission-specific platforms by Europe were utilized for expeditions. The research aimed to shed light on global environmental changes, the earth’s mantle and crust dynamics and tectonics, and the biosphere beneath the seafloor. Since the beginning in October 2013, it has been operated under a new framework as the International Ocean Discovery Program (IODP). *2 The JOIDES Resolution is a U.S. drilling vessel operated for IODP. Compared to the seep-sea scientific vessel Chikyu by JAMSTEC, it is used more often for drilling in shallow waters. *3 Core samples: Columnar samples of sediments (or rock) collected by drilling. The Kochi Core Center (Nankoku City, Kochi) operated jointly by JAMSTEC and Kochi University stores core samples (the total length reaching 100 kilometers) collected from the western Pacific, the Indian Ocean, and other seas by scientific ocean drilling. *4 Open oceans: Offshore areas where no factors from land such as fresh waters and sediments are affected. In general, it referees offshore zones beyond the edge of the continental slope. 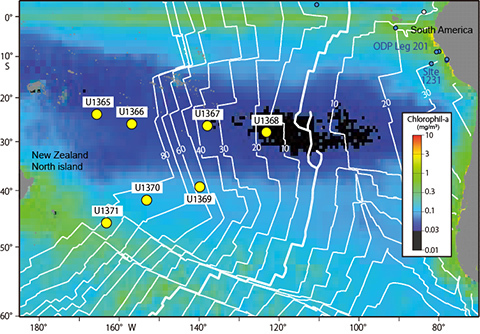 Figure 1: Drilling sites of IODP Expedition 329 “South Pacific Gyre Subseafloor Life” (U1365-U1371). The colors show sea surface chlorophyll-a concentrations. 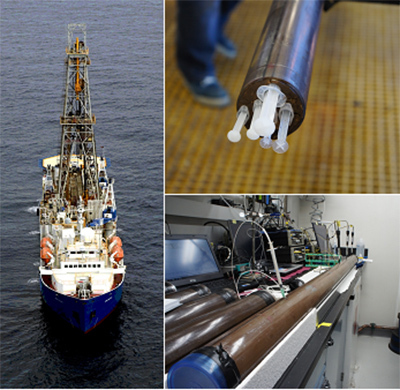 Figure 2: Left)The scientific drilling vessel, JOIDES Resolution; Upper right) Microbiological sampling of sediment during the IODP Expedition 329; Bottom right) After core recovery, the samples were immediately transferred to the cold laboratory on the vessel and the concentration of dissolved oxygen level was measured by censors. 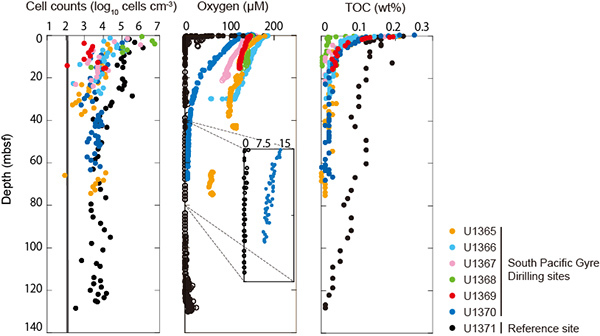 Figure 3: Depth profiles of cell abundance (left shown on logarithmic scale), dissolved O2 concentration (middle), and the total organic carbon content (right). Figure 4: Regions where dissolved O2 may be present throughout the sediment. Dark blue marks the minimum regions and light blue marks the maximum regions. Red dots indicate sites where O2 is known to occur throughout the sediment. 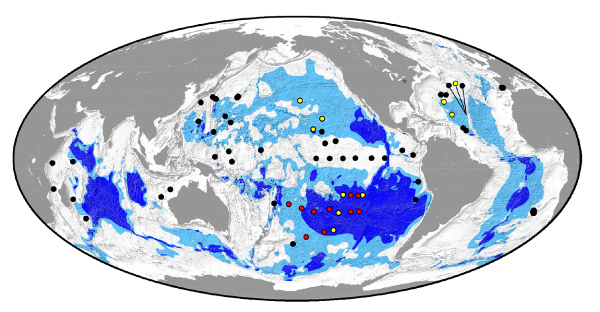 Black dots indicate sites where O2 disappears centimetres to metres below the seafloor. Yellow dots indicate sites where O2 penetrates many mbsf and may penetrate to the basement but is not characterized throughout the sediment. Dissolved O2 may be present in the basement over a greater area due to seawater advection through the basement. Figure 5: A fluorescent micrograph of microbial cell in deep-sea sediment at Site U1369 (green light in the center). 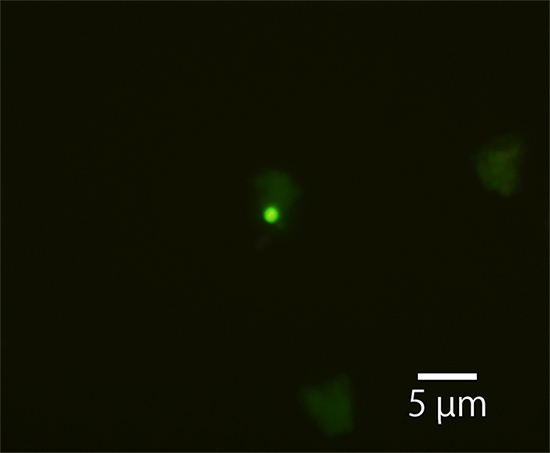 Intracellular genomic DNA was stained with fluorescent dye (SYBR Green I) after being separated from sediments. 1 μm = 0.001 mm.